Lena Woodward is a Holocaust survivor who wants to fulfill a promise she made to her friend over 70 years ago. 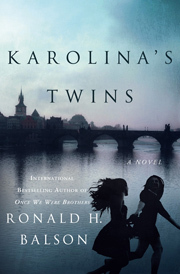 She wants to find her friends twins that were lost during the war in a Nazi occupied Poland. She hires Liam Taggert and Catherine Lockhart to solve the case but Lena’s son isn’t happy about the plan. He thinks his mother is delusional and senile and wants guardianship over Len’s matters. Even though this is the third book in a series, it works fine as a stand-alone. It was a sad book but also very good. I didn’t want to put the book down but keep reading! We have two timelines: Modern day where Lena tells the story to Catherine and Liam, and past where we follow Lena during the war. I thought it was easy to follow what timeline we were but I’ve read that many thought was messy. I liked Lena, Catherine and Liam but Lena’s son Arthur was a jerk. He was just concerned with his inheritance and not his mother’s wellbeing. I loved this and I’ll have to read the previous books soon. Me too, sad stories though.